NSW Police have added a potent new high performance weapon to its arsenal, with the addition of a 5-litre V8-powered Lexus RC F coupe. The RC F will serve as a multi-purpose solution for NSW Police, playing an active role in roadside campaigns to promote road safety while also featuring as a static display at community engagement activities such as the MS Sydney to the Gong bike ride. It will also appear at motorsport events including the Bathurst Six Hour during Easter as a race control vehicle, opening and closing the circuit before and after races. The coupe will operate in the NSW Police’s Southern Region, which is based in Wollongong and takes in a vast area from Deniliquin Local Area Command in the west to Goulburn and Griffith at its northernmost points. 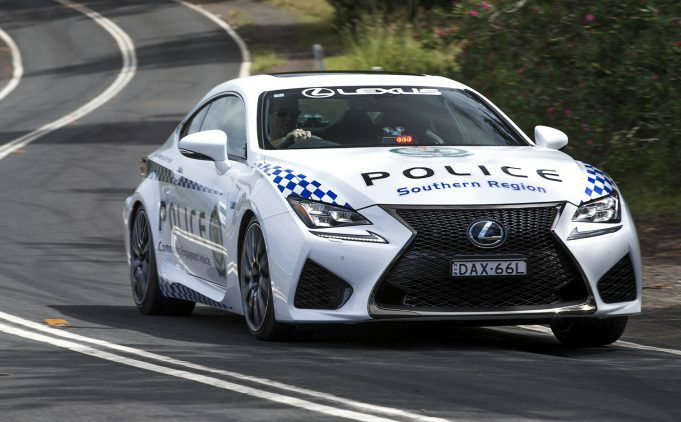 Inspector Jim Fryday of the NSW Police’s Southern Region said the RC F would be an ideal addition to the force’s busy events schedule. The RC F’s V8 engine produces 351kW and 530Nm and drives the rear wheels through an eight-speed Sports Program Direct Shift transmission, while an adjustable torque vectoring differential optimally distributes torque to each wheel. It provides focused handling thanks to a stiff chassis and racetrack developed suspension, featuring ZF Sachs monotube shock absorbers. It also has a Brembo brake package for optimum stopping power. The high performance mechanical package combines with an aggressive, aerodynamic styling package and cockpit-like interior that features competition-inspired high back sports seats, steering wheel, pedals and instrument meters.